As written a week ago, I attended a Regenerative Medicine International Conference in Las Vegas for the purpose of presenting a scientific paper that has generated a lot of interest and may influence how others practice Regenerative Medicine for arthritis. The meeting also served as a vehicle of continuing Cellular Orthopedic Education. The science of cellular biology is dynamic. It has been a major undertaking for me these past several years not only to have exchanged the scalpel for a trochar needle when managing arthritis but to reeducate in the basic science cellular biology. Three years ago, the Adult Mesenchymal Stem Cell was thought of as a precursor cell directly responsible for replacing cartilage in the arthritic joint. The thought at the time was that the Stem Cell would take on the characteristics of whatever environment into which it happened to be placed and morph into that tissue or organ. In just three years, scientists have changed their thinking based on continuing research. The Mesenchymal Stem Cell (MSC) is no longer looked at as a progenitor but rather, a Medicinal Signaling Cell directing the body’s response to injury. When placed into a joint, it signals molecules and cells from the local environment and from distant locations to alter the bio-immune response of osteoarthritis, act as an anti-inflammatory, relieve pain, improve function and perhaps regenerate cartilage. We have also learned that while one Bone Marrow Aspirate Concentrate intervention causes improvement, several may be the answer over an 18 to 36 month period. In addition, there is increasing evidence that not only should the joint itself be addressed but the bone immediately adjacent to the joint as well. In the orthopedic community, Subchondroplasty has been applied over the past several years for the patient with a painful joint, relatively “normal” X-ray and an MRI compatible with bone marrow changes in the bone adjacent to the painful joint. That core decompression might be visualized as a dentist relieving the pain and pressure of a cavity by drilling. In the case of the dentist, the resultant void is filled with a synthetic material. In the case of the orthopedic surgeon, the cavity created by drilling is filled with calcium phosphate. 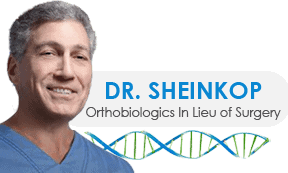 At Regenexx Chicago, – my practice, I will introduce the subchondroplasty, a minimally invasive needling for the bone adjacent to the joint in addition to the joint itself filling the voids created in the bone as I fill the arthritic joint with Bone Marrow Aspirate Concentrate. The Europeans have documented success and I will be able to improve results and extend indications with Bone Marrow Aspirate Concentrate for the arthritic joint and now the surrounding bone.